women”, and it means “leading adults”. Experience (including error) provides the basis for learning activities (Foundation). Adults need to be responsible for their decisions on education; involvement in the planning and evaluation of their instruction (Self-concept). Adults are most interested in learning subjects having immediate relevance to their work and/or personal lives (Readiness). Adult learning is problem-centered rather than content-oriented (Orientation). The term has been used by some to allow discussion of contrast between self-directed and ‘taught’ education. http://www.instructionaldesign.org/domains/management.html discusses some of the theories in relation to managegment. Why the sailing boats logo? 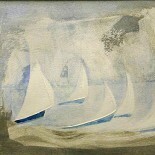 I’ve been asked why my logo and my business cards feature a painting called Sailing By V, which features little sailing boats. There are several reasons. One is that I’ve always loved the Sailing By theme music that precedes the shipping forecast every evening on Radio Four. I associate it with floating off to sleep, but of course for mariners, it’s the signal to listen up for the information on which your life may depend in the coming 24 hours. The theme was written in 1963 by the splendidly named Ronald Binge, and it is a circular piece, meaning it can be played for as long as necessary to fill in the time between the end of the midnight news and the start of the forecast. A second reason is that I love the sea and I love to see white sails as I look down from my office window over Cardigan Bay. I must have one of the best views in the world – and one of the best commutes, up the coast road from Aberaeron to Aberyswyth. A third is that I picture life as a voyage. As we set sail, we regularly re-chart our course and life tempts us to set foot on shores we often hadn’t dreamed of visiting. It often beaches us where we least expected it. And sometimes it throws storms or doldrums into our path, but by setting the right sails and paying attention to the most favourable winds, the majority of life is a pleasurable as sailing on a calm sea can be. Just recently I added a new string to my bow by becoming accredited to use the Hay Group 360 degree feedback tool which is designed to help you improve your emotional and social intelligence. You’ve heard of IQ, this is EQ. My grandfather, a profound influence on my life, though I’m only now beginning to realise it fully, used to tell me when I had to do something that scared me – read a poem in front of my school class for instance – “All you need to do is act as if you were enjoying yourself and you won’t be scared any more”. And I’d read the poem out loud as a rehearsal, which wasn’t so bad, and then read it to him again, this time pretending I was enjoying it, and it actually worked. I felt better about it and he said it sounded better and when I stood up in class that felt better too. As you make the transition into senior management, walking the walk and talking the talk – consistently – is vitally important, so that those who depend on you to lead them can have confidence in you. Whilst you may not always feel a hundred percent confident, acting “as if” you were, can go a long way in helping you to convey the right impression. “Whistling to keep up courage is no mere figure of speech. On the other hand, sit all day in a moping posture, sigh, and reply to everything with a dismal voice, and your melancholy lingers. There is no more valuable precept in moral education than this, as all who have experience know: if we wish to conquer undesirable emotional tendencies in ourselves, we must assiduously, and in the first instance cold-bloodedly, go through the outward motions of those contrary dispositions we prefer to cultivate. In 1958, Robert Tannenbaum and Warren Schmidt published a model of leadership explaining the different ways that leaders interact with their followers. The model is a continuum that showed that, at one end of the spectrum, a leader can have nearly total freedom to decide while, at the other end of the spectrum, the team can have nearly total freedom to decide. In-between these two extremes, Tannenbaum and Schmidt identified 7 types of leadership style. Knowing these style options and being able to apply them to a workplace situation correctly is a useful skill in effective leadership. What are the 7 approaches on the Tannenbaum and Schmidt Continuum? Here are the 7 different leadership approaches, starting with the far left end of the spectrum. 1. The Leader Tells. This approach is typified when a leader says: “The problem I face is.. I want you to…” This is the autocratic style of leadership. While unfashionable today, it is often needed when teams are new, inexperienced, or weak. As the team gain in cohesion and commitment, it becomes less and less appropriate. 2. The Leader Sells. This approach is typified when a leader says: “The problem I face is.. I want you to… because…” In the selling approach, it’s still the leader in the driving seat but there is the need to get others to understand why they are doing what he or she wants. 3. The Leader Tests. This approach is typified when a leader says: “The problem I face is.. I want you to… What do you think…?” Notice now how the leader explains the problem, comes up with an idea but checks it out with the team. If they’re not ready for more responsibility, they’ll go along with what the boss wants; if they are ready, then he or she leaves the door open for them to discuss their thoughts. 4. The Leader Consults. This approach is typified when a leader says: “The problem we face is.. What ideas do you have for solving it…?” Notice now how the leader drops the word “I” in exchange for the word “we”. Notice also how he or she no longer feels the need to have an answer ready. The leader is effectively inviting the team to problem-solve with him or her. 5. The Leader Joins. This approach is typified when a leader says: “What is the problem we face? How can we solve it? Any ideas?” Now comes a turning-point. The leader no longer owns the problem and solution alone. By asking the team to consider the problem as well as the solution, he or she is nudging them into outright ownership themselves. 6. The Leader Delegates. This approach is typified when a leader says: “Problems keep cropping up… Can you see what’s going on, come up with some ideas and get back to me…” Now the leader knows that there are problems in certain areas of the job but, in moving from the word “we” to the word “you”, gives the team the green light to find answers. The decision may still be the leader’s but the team can have a high level of influence over the final outcome. 7. The Leader Abdicates. This approach is typified when a leader says: “Sort out any problems that crop up. I’m here if you need me but only if you really need me.” Here the language of the leader is coded. What he or she is really saying to the team is that they have full responsibility for identifying, analysing, and resolving the problem but accountability still rests with the leader. Tannenbaum and Schmidt’s 7 levels of control and freedom correspond broadly to a team’s level of development. When a team is immature, ie unmotivated and unskilled, the styles will be on the left-hand side of the spectrum. When a team is motivated and skilled, the styles will be on the right. Tannenbaum and Schmidt thought that there were two other main factors to be taken into account when selecting a style. One was the demands of the situation. For example, is the problem urgent or high-risk? Does the organisation’s culture allow for delegating styles? The other issue was whether the leader had the skills and willingness to manage a full range of styles across the spectrum. Tannenbaum, A.S. and Schmitt, W.H. (1958). “How to choose a leadership pattern”. Harvard Business Review, 36, March-April, 95-101.